We are a family business with a few years of experience with a German market and even longer experience within the Polish market in the frame of locksmith production and artistic metalwork. We are still developing our activities and aim for providing services for a prospective German, Dutch, Belgian, Danish and Austrian market. We do our best to make our customers satisfied with our products' high quality, short term of execution and favourable prices. We are aware of the fact that a satisfied customer is the best recommendation for our services and an extensive list of reference is the best advertisement of our company. In addition, we have a personal satisfaction of a well-done job. 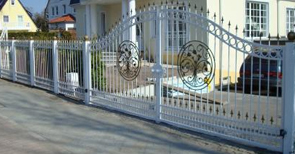 We manufacture metal fences, double-leaf and sliding gates, wickets, gratings and metal stairs. We also produce panel fences in a wide range of dimensions and favourable prices for both companies and individual customers. There is also a possibility to provide our customers with the installation services of the purchased products. 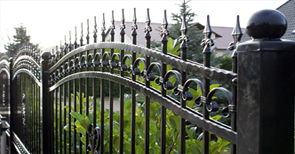 Owing to our vast experience as well as the plasticity of steel, we are able to manage the most unique and demanding orders of our customers. In the frame of sales and installation of automation, we cooperate with the recognized companies such as the German ‘HORMANN' and the Italian ‘NICE'. In order to ensure the extended and comfortable use of our products, we employ locks manufactured by a recognized company . All our products are hot dip galvanized in order to protect them against corrosion. Also, they may be powder coated on our customers' request. Nowadays fences are perceived as a carefully planned investment. Therefore, they have to meet a series of functional requirements such as the protection against unwelcome guests but also they are a decoration of the property through their esthetical values, high quality and durability. We may present you with the increasing list of the satisfied customers at your request. Please acquaint yourself with our offer and fill in a short offer form if you wish to receive a free evaluation of our products you intend to order.